Just like other Mesoamerican civilisations that came before and after them, the Mayans followed a polytheistic religion and therefore there were many gods and goddesses in their pantheon. The religious concepts were fully developed during the Classic Period of Mayan civilisation which extended from 250AD to 900AD. There were only a few goddesses along with more than 100 gods in the Mayan pantheon. The Mayan religion influenced subsequent civilisations such as the Aztecs who included some of their gods in their own pantheon. In its preliminary form, Mayan religion took birth during the Late Pre-Classic period before 250AD. However, it was transformed into a fully developed religious system during the Classic Period between 250AD and 900AD. It was during this period that hieroglyphic texts were written and religious inscriptions are found in abundance on temples and pyramids in the region. Further, there are abundant signs of sacrifice, including human sacrifice, during the Classic Period. The religion survived the collapse of the Mayans during the Post-Classic Period and also influenced other civilisations of Mesoamerica. Just like other Mesoamerican civilisations that came before and after them, the Mayans followed a polytheistic religion and therefore there were many gods and goddesses in their pantheon. There were a lot of Mayan gods and goddesses in the pantheon, although some gods were the most powerful. 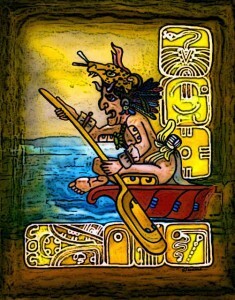 For instance, one of the most powerful Mayan gods was Chac who was the god of rain, thunder, fertility, and agriculture. The Mayan sun god, also one of the most powerful Mayan gods, was called Kinich Ahau or Ahaw Kin. Further, there was the Mayan maize god called Yumil Kaxob who was equally important considering that maize was the staple grain of the Mayans. Various kinds of sacrifice, including human sacrifice, were offered for all these gods. Priests had very important function in Mayan religion since they were considered intermediaries between Mayan gods and goddesses and the common people. Religious festivals and rituals were performed by the priests who were often dressed as gods. The ritual of human sacrifice was also performed by Mayan priests. Thus the central role of priests in Mayan religion raised their status which was more or less equal to that of the nobility. Religious symbolism was quite important in Mayan religion just like the religions of other Mesoamerican civilisations. Mayans Gods and goddesses were often represented in forms that symbolised their powers. For instance, in order to symbolise the god of rain Chac, artistic representations show him having amphibian features and tears coming out of his eyes. Similarly, the god of death was shown with various adornments made of bones. Various Mayan codices detail religious symbolism about Mayan gods and goddesses. According to Mayan beliefs, dead people went to the underworld which was ruled by multiple Mayan gods, although some were more powerful than the others. Only those who died during childbirth or were sacrificed could survive this fate. However, it is possible that there was never a unified concept of afterlife among the Mayans. Mayans also had a concept of paradise in the afterlife where good people went after they died. Evildoers, on the other hand, were condemned to the underworld where they were eternally tormented. The god of death and the underworld was known as Yum Cimil. However, while he was the most powerful god of the underworld, there were other gods and their assistants too who governed the underworld. Mayans kings had A close relation with rituals offered to Mayan gods and goddesses. Kings were considered having descended from gods and rituals of kingship were supremely important during the Mayan Classic Period. The blood of kings was considered sacred and thus the ritual of bloodletting was common among the royalty. Due to this sacredness of human blood, the human sacrifice of the kings also had more value and captured members of the enemy royalty were sacrificed for this purpose. Religious rituals were also performed upon the ascension or death of a king. Mayan gods and goddesses had rich mythology associated with them in which they interacted with each other just like humans. Important tales in the Mayan mythology concern with the creation of the earth, and the origins of various plants, the concept of time cycles, and end of the world. Some important mythological tales include the marriage of the sun and the moon, opening of the Maize Mountain by lightening deities, and others. Ancient Mayan paintings and monumental iconography provide rich information about Mayan mythology. Fundamental beliefs in Mayan religion included calendar mapping, offering and sacrifices, prayers, and pilgrimages. Prayers involved various kinds of incantations and litanies involving saints, angles, and deities. Beliefs and rituals also included various practices to attain purification. This included fasting, bathing, and sexual abstinence. Pilgrimages were carried out to different places which had religious significance. The concept of sacrifice was quite important in relation to Mayan gods and goddesses. As per the Mayan mythology, the gods sacrificed their body parts and lives in order to create the world and thus sacrifices offered by humans were a sign of gratitude. This included offering of food and material possessions, the ritual of bloodletting and most importantly, the human sacrifice. The concept of human sacrifice was not as important as among the Aztecs but it was nonetheless performed in a variety of ways. Pyramid-temples were the places where the Mayans worshipped and performed various rituals and religious ceremonies. There were two types of temples reserved for the worship of Mayan gods and goddesses. The first one had flat top where temple was made. This temple was used during religious ceremonies and often human sacrifice was also performed there. The other kind of pyramid did not have flat top and was also relatively smaller in size. This pyramid was not supposed to be touched and was considered sacred. Mayans followed a polytheistic religion and thus there were many Mayan gods and goddesses worshipped throughout the kingdom. Some gods were more powerful than the others such as the god of rain and fertility Chac, the god of death and underworld Kinich Ahau, and others. Various kinds of rituals were offered to gods, including the supreme ritual of human sacrifice. Rituals and ceremonies were performed by the priests who had central importance in Mayan religion.